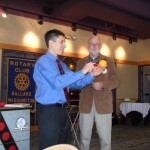 Thanks Ken, Cameron, and the members of the Rotary Club of Ballard for a great time yesterday! 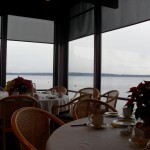 Looking out at Shilshoe Bay from Anthony’s Homeport Restaurant, they DO have the best view of any Rotary Club. 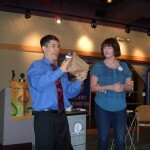 Thanks to Rotarian Ken for taking and sharing these photos. And I’m still laughing about Henry, aka “George”, who was a hoot helping out in the show. 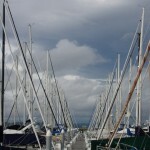 This entry was posted in Uncategorized and tagged Ballard, entertainment, rotary, rotary program, service club, Shilshole Bay. Bookmark the permalink.